Chopstix Group UK the fastest growing Oriental quick service restaurant chain goes international with franchise partner Applegreen of Petrogas Group Ltd launching their first restaurant in Galway, Republic of Ireland, Thursday 5th March 2015. The current UK estate consists of 45 restaurants across the country providing employment for over 250 staff satisfying the nation’s appetite for healthier Oriental fusion fast food. Franchise partner Petrogas, the largest Irish independent forecourt retailer, operating the Applegreen brand identified an opportunity for a Noodle Bar within their brand and customer lead portfolio, and the market. 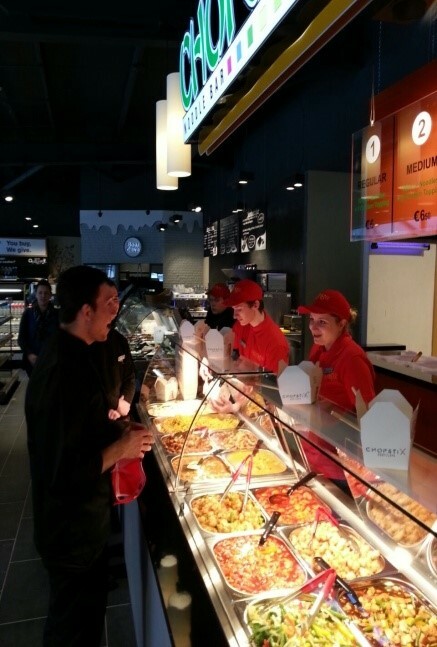 The first Irish franchised Chopstix Noodle Bar opened last week in Applegreen Galway on Tuam Road. Quality, flavour, and customer satisfaction, delivered at incredible value price points are at the heart of this new Oriental restaurant. Recent reports indicated that the Irish consumer market has a growing demand for food “theatre” and ethnic cuisine. Chopstix launched at an ideal time in the Irish market, as it is well known in the UK for its front of house cooking with fresh ingredients, providing “chef theatre”, and its expansive menu serving both rice and noodle dishes with a selection of over 12 signature toppings, inspired by traditional Chinese, Malaysian, Thai, and Taiwanese specialities and using Halal certified chicken. Applegreen already offers a large number of quick service restaurants, such as Subway, Burger King and Costa Coffee, with Chopstix on board; Applegreen is now able to delight its consumers’ taste buds with a new Oriental food-to-go option, while Chopstix is ready to warmly welcome its Irish customers.